Despite the fact it’s extremely dark in Sweden during December, in my opinion, it is a really lovely time to be here. The season is full of Christmas lights, the julbord, glögg, seven kinds of cookies, and complete with dancing around the Christmas tree holding hands. The celebration essentially lasts from the First of Advent until January 13th when you throw out your tree and smash up your gingerbread house on tjugondagknut. In between there are celebrations for the Nobel Prize on the 10th, Lucia on the 13th, and official Christmas celebrations last for 3 days starting with Christmas Eve. Donald Duck is even an important part of the festivities. I kid you not. The Christmas season in Sweden begins with light. It is the perfect time of year to bring light to the dark beginning with the first Sunday of Advent when the Christmas decorations come out in force. 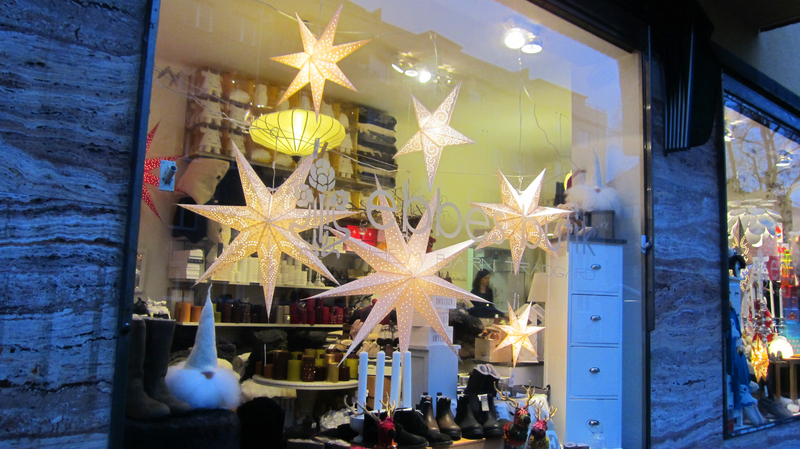 Advent stars (adventsstjärnor) symbolize the star of Bethlehem that guided the wise men to the baby Jesus in the manger and they bedeck business and residential windows alike with various sizes, colors, and numbers of points. The paper stars originated in Germany in the 1880s and started to be imported to Sweden in the 1930s. It wasn’t until 1941 that they were manufactured in Sweden. Erling Persson who would later become the founder of Hennes & Mauritz (H&M) wanted to create a cheaper version of the stars in comparison to the expensive German imports. His red cardboard stars covered with little star-shaped holes were an instant success. The tradition spread quickly and has held fast. Today you can buy Advent stars in wood, metal and straw versions and they are one of the most common Christmas decorations. The other common light this time of year is the electric Advent candle sticks or adventsljusstaken with seven lights representing the days of the week. They were first manufactured in 1937 by the Philips company in Gothenburg and quickly gained popularity as a safer alternative to open flames. They are linked to an old Swedish tradition of placing lighted candles in the windows to help light the way to the church for Christmas worshipers. Today you can buy them in various colors, materials, shapes, and sizes. Being part Swedish, we had adventsljusstakens in our windows at Christmas time when I was growing up. On more than one occasion they prompted my teenage friends to ask if I was Jewish. That still makes me chuckle. In addition to all of these light sources there are also Christmas lights up in every city and town. But to my dismay the overwhelming majority of the lights are white which perhaps creates the brightest light source, but makes me really miss colored lights. Colored lights are so unusual here that they really make you turn your head. As a kid I remember how fun it was to ride in the car and look down the different streets to see the various colorful displays. White lights are much more common in the U.S. now too, but the colored lights are still out in force and I really do miss them. Aside from all of these electrified sources of lights, winter in general is filled with candlelight. Christmas trees are often decorated with white lights and red decorations. People purchase their Christmas trees much later than I am used to. The lot down the street didn’t open until December 8th, and it was the same with the lot outside the grocery store. Many people wait to purchase their tree until the last week before Christmas. I think this is partly because they leave it up until January 13th when Christmas officially ends with tjugondagknut (a future post). In terms of decorations, red hearts are a strong symbol of Christmas, which has taken me nearly 5 years to adjust to, but I now associate red hearts with Christmas just as much as Valentine’s Day. Other decorations I find particularly interesting are pigs, and the red mushrooms with white spots. Flowers also play a big role during the holiday season, particularly Amaryllis, hyacinth, and heart-shaped topiaries. Glögg (mulled red wine) and pepparkakor (gingerbread) show up throughout the month of December at any kind of festive gathering. Heart-shaped pepparkakor are the norm and the glögg is served from small glasses with tiny spoons to scoop out the blanched almonds and raisins you dumped into the cup at the beginning of your glögg experience to successively macerate in the alcohol for a crunchy-sweet kick once you drink your way to the bottom. You can get glögg in a non-alcoholic form as well, or defer to julmust, the soft drink of choice that comes out at Christmas time (and I swear the unsold bottles are pulled from the shelves and relabeled as påskmust at Easter). It tastes like a cross between coke and Dr. Pepper and many a Swede (excluding this semiswede) relishes a glass of julmust this time of year as I’m sure it brings back childhood memories. Marzipan is a treat that plays a significant role this time of year, often fashioned into pigs and santas. December 24, 25, and 26 are all red days (official holidays) in Sweden and the main Christmas celebration is on julafton (yule-AF-tohn = Christmas Eve) complete with the julbord (YULE-bohrd = Christmas table) meal and the opening of Christmas presents. A traditional Christmas Eve celebration begins in the afternoon with a fika (a coffee break of sorts) that classically includes seven different kinds of cookies/cakes. It used to be the case that no respectable lady would host a tea party without at least seven different kinds of cookies, and that tradition is carried on to Christmas Eve in some households. This program is why Disney tunes such as When You Wish Upon A Star and Bella Note are considered Christmas songs in Sweden. The last clip of the show is generally something new, but the rest of the program is unfailingly the same. The julbord is not unlike the American Thanksgiving tradition in the sense that everyone in the country is eating pretty much the same thing, and everyone eats way too much. Although there is some variation from household to household as to what appears on the julbord there are several standard dishes that are tackled in three courses. The first generally includes a variety of pickled herring and cured salmon, the second is bread, ham, liver pâté, red beet salad, and cheese, and the final course is comprised of the warm dishes with Janssons frestelse (julienned potatoes baked with cream, onions, and anchovies), dopp i grytan (bread dipped in broth), meatballs, sausages, pork ribs, and cabbage. The meal is topped off with risgrynsgröt (rice pudding) served with strawberry sauce. After dinner it’s time to dance around the Christmas tree, or the house in general, holding hands. Nu Är det Jul Igen (It’s Christmas Again) is one of the most common songs used for this activity. And just as it ‘s becoming complete torture for the kids who have yet to open their Christmas presents, jultomten (yule-TOHM-tehn = Santa) shows up to hand out the gifts. A family member dresses up in a Santa suit (all families seem to have one), donning what I would have found to be a pretty scary mask as a child, and hands out the gifts from under the tree to everyone. Poems written by the giver to the receiver, providing insight to the contents of the package, are traditionally attached to the gift and read by jultomten. Lutfisk is a notorious Swedish Christmas dish and is typically served on Christmas Day. It is a remnant of the Christmas fast when meat was replaced by fish during the winter when fresh fish was hard to come by. The dried ling, or sathe, was alternately soaked in water and lye to make it edible again (although some people would say that doesn’t help). Slathering it with a white sauce, melted butter, and even ground mustard in the southern part of Sweden helps to make the gelatinous, reconstituted fish more palatable. One year my sister-in-law had the inspired idea to top it with bacon. I have to say there was a lot more lutfisk left than bacon by the time I made it through the buffet line. It’s a love-it or hate-it dish. Annandag jul (the second day after Christmas), is also a holiday and can mean a turkey on the table, or simply mounds of julbord leftovers. December may be the darkest time of the year in Sweden, but I find it one of the brightest. 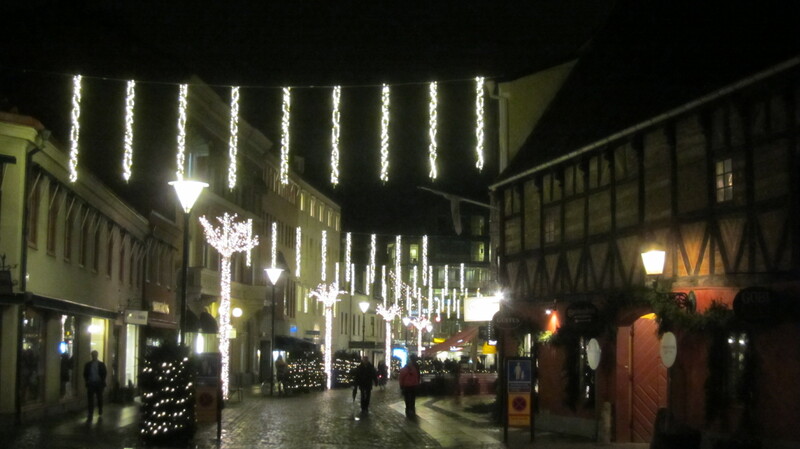 Sweden gets cozy with a lot of lights and candles, traditions, and a focus on family. It also brings the winter solstice on the 21st which literally means the days will start getting longer. So despite the fact that I long for my family and colored Christmas lights, I’m pretty content here during December (but will probably be aching for some sunshine come February). Wherever you are in the world, whether you are celebrating Christmas or not, I wish you peace and all the best in the New Year. Åh nej! Var är den gigantiska bordslampan? Pappa. Tack godhet! Slutligen den vackra skålen, lutfisk, har glidit ur tangentbordet. Tack så mycket. Kom ihåg Ingegerd hur mycket jag haft hennes fisk dagen efter jul när vi hade så mycket tid där. Vi har sådana förtjust minnen av Habo och hela familjen Nilsson. Pappa. One year my dad had me get some lutfisk for his mother who was 100% Swedish but was born her in Michigan. I found it to be pretty disgusting. And my family (all but me) would have salted cod at breakfast on Christmas morning. My folks liked Coleman’s mustard (from the powder) on theirs and grandma had hers with scalded milk. The whole house smelled of fish. I didn’t like fish (still don’t over 50 years later) and could hardly stand the stink of the boiled cod. The adults and my siblings loved it and I just made myself a bowl of cereal. Guess my 50% Swedish blood wasn’t enough to make me eat that cod – LOL! I do count this as a good memory, though. I really think the secret is the mustard mixed into the white sauce. Bacon doesn’t hurt either! Thanks Maia, very interesting with good pictures. Merry Christmas. Merry Late Christmas Jenna. We loved the Christmas card! Such pretty pictures! I love blogs about Europe! My father’s parents were both born in Sweden. One year when I was kid my aunt decided to make lutfisk as a treat for Christmas. I remember it was in a milk sauce and we all hated it, even the cat wouldn’t touch it. Now 70 years later I finally got to visit Sweden. I unwittingly ate some salted licorice. I spit it out, it has the same taste as lutfisk!! This flavor is either an acquired taste or a genetic attribute that skipped me. But I loved Sweden and the people. I would gladly have stayed much, much longer. Thanks for sharing your story. Although I’m not a lutefisk fan, I can manage it with some sauce and mustard. But I draw the line at the salty licorice. I’m not a licorice fan to begin with, but my brother is and I mixed some salty ones into his gift bag once. It was a no go. He said it tasted like a cross of cat pee and poison. It must be an acquired taste.